Above, you see my first vegetable garden. What an eyesore....and the animals! Can you feel my frustration? Raised beds are a necessity for me. The original veggie garden ground-breaking almost turned into a shovel-breaking as most of what's under the grass is large tree roots, heavy clay, or rocks. In the photo below, you'll see the original year one garden - the L-shaped garden. You'll also notice lots of shade. Though I'm not always so astute, I was wise enough to chart the sunlight in my backyard and found the sunny hours were between 12pm and 6pm. 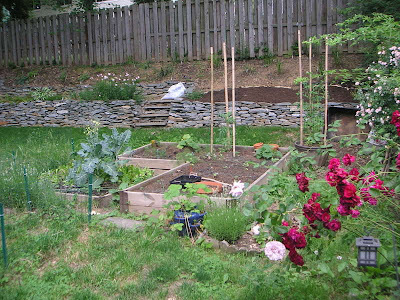 I built the raised beds directly under the sun, as most of my backyard is shaded. Year two brought an expansion (naturally, right?) 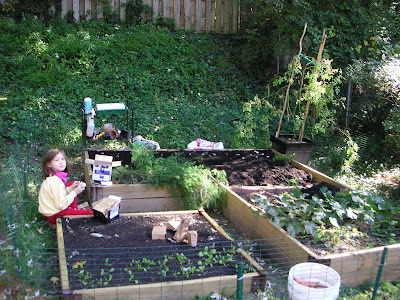 - a 4X4 square to fill in the L. Below, the inspiration for this garden (my then 7 year old) is helping me plant garlic. See that horrible slope behind her? It's covered in weeds, poison ivy, sunken in dips, tree roots, and broken liquor bottles from the previous owner of the house. Something had to be done. After much research and a summer of unlimited and unnatural confidence, my husband helped me build the stone wall. The steps lead to a walk that leads to a little sitting area on the slope (outside the left edge of the photo). The plan is to move the fire pit to this cozy sitting area. I'm really pleased with the wall project. The only problem is...it really calls attention to the ugly wooden vegetable garden. I thought about using stone, but envisioned that a large, rectangular, stone vegetable garden would look too "heavy" and too boxy. At the same time, I really wanted to expand as much as possible while still keeping the garden out of the shade. After ruminating over this for two years, I found the potager below to be the perfect solution. It was easy for me to build myself. There was left over stone from the wall project. The stone maintains a consistent look, but the potager design keeps the garden from looking too utilitarian or heavy. The four rectangles allowed for a slight expansion while still providing paths between the beds so as to prevent trampling the soil. The rounded corners at the center of the potager helps soften the edges. I also love the potager's symmetry. The design maximizes the gardening area under the sun. In the separate beds, I also added monarda, lavender, and a selection of herbs and marigolds in an effort to attract pollinators and beneficials. Of course, having a space in the center allows for a container planting that is a beautiful focus as I walk to the back yard from the side yard, or as I look out the back window. Though I anticipate minor repairs each spring, the results are well worth it. Hi Wendy~~ How gratifying it must be to look out and see the results of your labor. I love your design and the stone you chose to use. Don't you love it when hard work pays off so well? What a wonderful garden project Wendy. Its a really worth the effort to put all the energy in getting your dream garden done. Just curious - where do you get your stones from? Are they free by the riverside or you have to purchase them? I can suggest you could use broken tile slabs easily available in tile shops - they will free give it to you as these are disposed. Above all, its truly a beautiful garden. Wendy, Not sure whether my comment went thru as the PC got jammed and so I guess it didn't. You got a lovely garden Wendy, something which I often dream of having a big space to spend all my time with my family. Few things I would like to mention, do you collect those stones or bought them. Would like to suggest that you could use tile slabs for your raised beds - it would look elegant compared to wooden piece. Nice job Wendy! The new potager looks much more natural compared with the earlier 'construction' looking one. But most importantly, the four rectangles give you much more space! Also, now you can organise different crops accordingly. Btw, does the good soil fills deeper than the height of the border (stones)? Just curious how deep is the good soil. I think you have done a good job in your garden. The stones blended in nicely and gives it a natural, cooling effect. It looks like you had some good help here. You should get some good stuff out of that space, probaby enough to share! 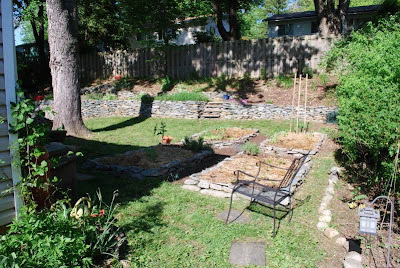 I like the stone walls and the grow boxes, very nice, Wendy! 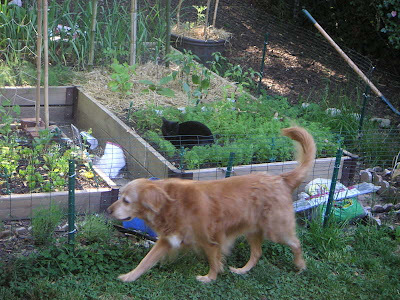 Truly a "potager", not just a veggie garden. 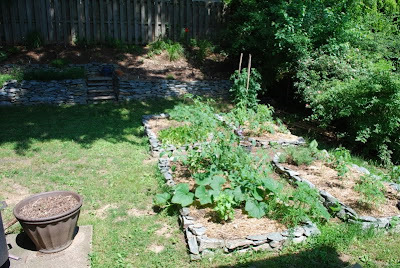 Ours is just a hodge podge of thrown together raised beds and half-barrels. You have inspired me to press for a more pulled together look. When it fills up with verdant growth, yours will be spectacular. Beautiful!! It is so exciting to create and see how things turn out! Awesome job! Well done..beautiful!Great photos! Love the kitty and puppy..did they help? Grace - thanks for your comment, yes, the wall was defintely gratifying. The potager is a nice sight too - much more so than the old garden. James - good idea about the tile slabs - I never take advantage of these kinds of things as I should. The stone is a locally quarried stone. I can't remember the name, and it wasn't my first choice, but it was among the cheaper stone and the end product was nice. Thanks Stephanie! I probably lost about 2 inces of soil this first year. I envision having to top off each bed every year. Lynn, Rosie, Autumn - thank you! you're so sweet. Ricki - your potager is amazing. I wish I had all that room. "pulled together" is a great compliment. Thanks. The plantings on the slope have started to really take off. It's probably in year 3 by now. Most else is still young. I also can't wait for things to really get going. Kiki - the cat and dog...faaaarrrr from helping anything except driving me crazy. After following the progress on your rock wall, I really enjoyed seeing this recap and photos of your new potager, all together in one post. Lugging rocks around IS a lot of work, but very satisfying in a this-is-reality-here-in-Nature's-world way. And the feeling of accomplishment is well-deserved. lovely garden, i can just imagine the sweat which poured in doing it. And i laughed much in seeing the animals, terrible. Then, do it again! BTW, i love eating the boiled soybean on your bloghome, been missing it. The last taste was when i was still in elementary school. Your yard looks wonderful. The stone wall is great and must have been a lot of work. Well worth it though. Thanks Lindalou - I can't even imagine doing it again! I have nightmares that it falls over. Andrea, I love edemame. Sometimes I look at that photo and see the bean that is sort of split and imagine just popping the soybean in my mouth. A great snack with sea salt. yum.